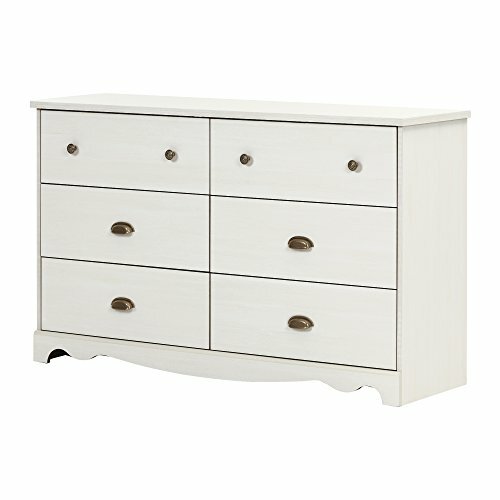 This magnificent dresser from the Caravell collection will fill your child’s room with charm and simplicity. Its stylish kickplate and handles help create the country style you’re looking for. Metal handles in Antique Brass finish. Metal drawer slides. Drawer dimensions #1: 23.25'' (L) x 13.625'' (D) x 4.375'' (H). Meets or exceeds all North American safety standards. Accessories not included. Requires complete assembly by 2 adults (tools not included). 52'' (W) x 18.875'' (D) x 31.375'' (H). Box dimensions: 57.992'' (L) x 19.803'' (W) x 6.654'' (H), 117 lb. Ships in a heavy box, make sure to have a friend with you. Packaging tested and certified to reduce the risk of damage during shipment. Made in North America with non-toxic laminated particleboard. 5-year quality guarantee. Any questions? Contact South Shore, the manufacturer, available 7/7 by phone, email or chat.